How would it feel to lose it all? Some people don’t keep anything precious on their computer. They use a web-based email system (Gmail, Hotmail, AOL mail, Yahoo mail), they don’t use Bookmarks (Favorites), and they don’t use their computer for much more than email, web browsing, or playing games. They don’t really have anything to lose. (They might, with the email, but we’ll talk about that another time). If this describes you, you have nothing to fear, and you need to make no contingency plans. If, however, you keep anything precious on your computer (documents, pictures, music, email messages/addresses, etc. ), or you have anything that would bring you grief to lose, you need to take steps to keep your data safe and back up your files. There are a couple of components to making backups: (1) the media you use for a backup (CDs/DVDs, flash drives, and external hard drives), and (2) the method you use to get the files onto the media, whether it’s manually copying files, or using a piece of software that makes it easy for you and automates the process. The method of backing up is the other piece of the puzzle: the software you use to execute the backup. Windows comes with its own backup program, and other backup software may have been preinstalled on your computer. (Macs come with an application called Time Machine.) 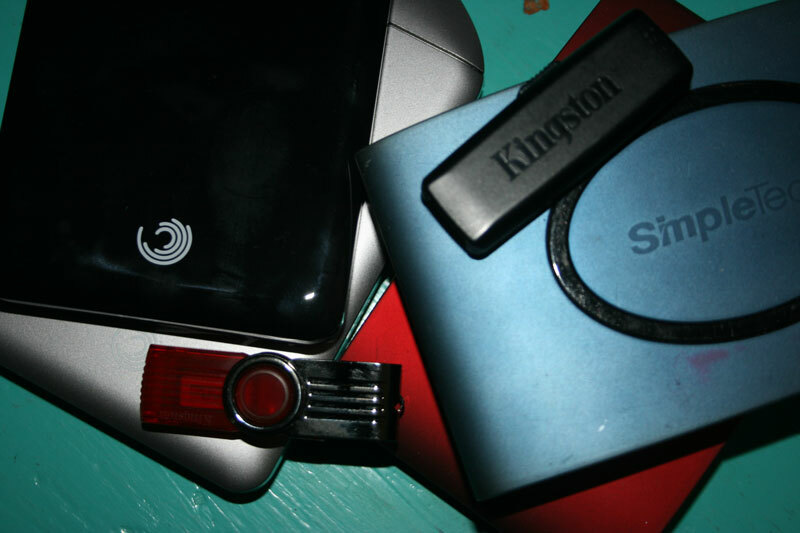 If you buy an external hard drive, the drive will often come with its own backup program. Many backup programs compress the backed-up files into create a kind of file called a “data set,” and you won’t be able to get at a particular document or picture without using that same backup program (a process called “restoring” the file). You can’t just plug that drive into any computer and get immediate access to your files. I use a $30 program called Second Copy, and there are many, many things I like about it. I can have various backup profiles, which can be scheduled to run at regular intervals, or run on demand. After years of doing things the hard way (manually copying files onto external drives), the process is now easy, and takes a fraction of the time. Second Copy makes a second copy of the files in their native format in the same folder structure, so I can take that drive to any other computer and be able to read the files. (An equivalent for the Mac is a nifty program called SuperDuper.) I find Second Copy very simple to use (all the work is in determining what you want to back up). If the process is hard, you’re not going to do it enough (if ever). If the process is not automated, you’re not going to do it enough (if ever). Online backup services combine the two components, using software on your computer to copy files via your Internet connection to a company’s computer. Some of the more popular services are Carbonite, Mozy, and Dropbox (which isn’t a “backup program” per se, but it can be used that way). Dell and Symantec are also in the game, and you might discover that software preinstalled when you buy a new computer. These services are growing in popularity for lots of good reasons. Some are free (up to a certain amount of storage space), and they offer the security of off-site backups (a backup on a drive in your office does you no good if your house burns down). They can also allow you to log in from any computer and gain access to your files on their servers. (Possible problems: someone hacking in to your files on the company’s servers, or a rogue employee or who-knows-what.) Personally, I’m not quite there with entrusting all my stuff to a corporate entity. But I know some folks who swear by these services. In addition to running Second Copy, if I’m working on an important document into which I will put hours of work that I don’t want to lose, I periodically save a copy of the file to a flash drive (or onto another computer on our home network). If you back up your files locally, you should find a way to take a copy of your backup to another location periodically—a trusted location, so that if your house burns down, you’ve got a stash somewhere else. So there you go, the basics of making backups. If you care about keeping your data backed up, get started ASAP if you’ve not started already. And if you think you have a backup in place, check it once in a while to make sure it’s working right. See if you can tell when it last ran, or see how easy those files are to access. Let me know if I can help further. Feel free to ask questions in the comments below, and I’ll answer them. This entry was posted in tech and tagged backup, external hard drive, flash drive by eileen. Bookmark the permalink. How can I transfer My address book from Outlook to my G-mail account .? First you would need to “export” the info from Outlook to a file, and then “import” the information from the file to Gmail. Generally a special kind of text file called a “CSV” (“comma separated values) file is used for this purpose. Follow the beginning and the end, and ignore the stuff in the middle about Windows Mail and Thunderbird. When you’re doing the first part (the export), when prompted to save the file, give it a name like Outlook Addresses and put it in My Documents, so you’ll know where to find it when you get into Gmail to do the second part (the import). Happy trails, and let me know if I can help further! I hope you’ll put a photo of yourself on the blog. Not all of us are lucky enough to have met you in person. I’d like to know more about another location for back-up. Good luck with you new blog.